I feel like I should confess something. I don’t like sewing costumes. I’m also not used to celebrating Halloween. But I’m nothing, if not prepared. I snapped up three out-of-season witch costumes on Ebay a few months ago, breathed a sigh of relief and hoped that I was off the hook. I’m a pretty good saleswoman when I want to be. What, you want to be a tiger, not a witch? Well, let’s put the striped top on underneath the witch dress and you can be an extra scary witchy tiger, yeah! Middle child wasn’t playing this game. 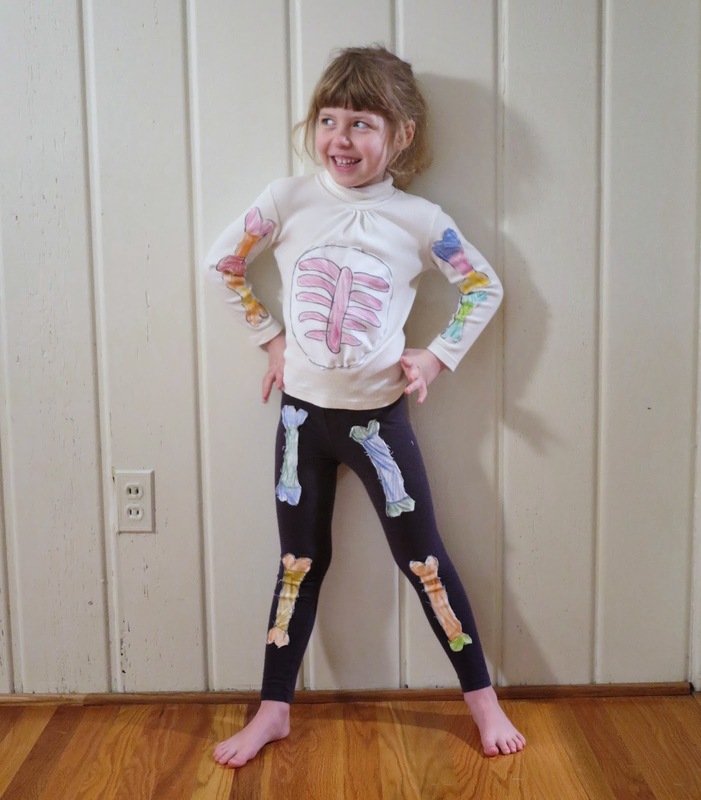 The day before Halloween, she decided that it was absolutely imperative that she become a skeleton. I told her that this need could be met, but only if she could make the costume herself. I helped her a bit. 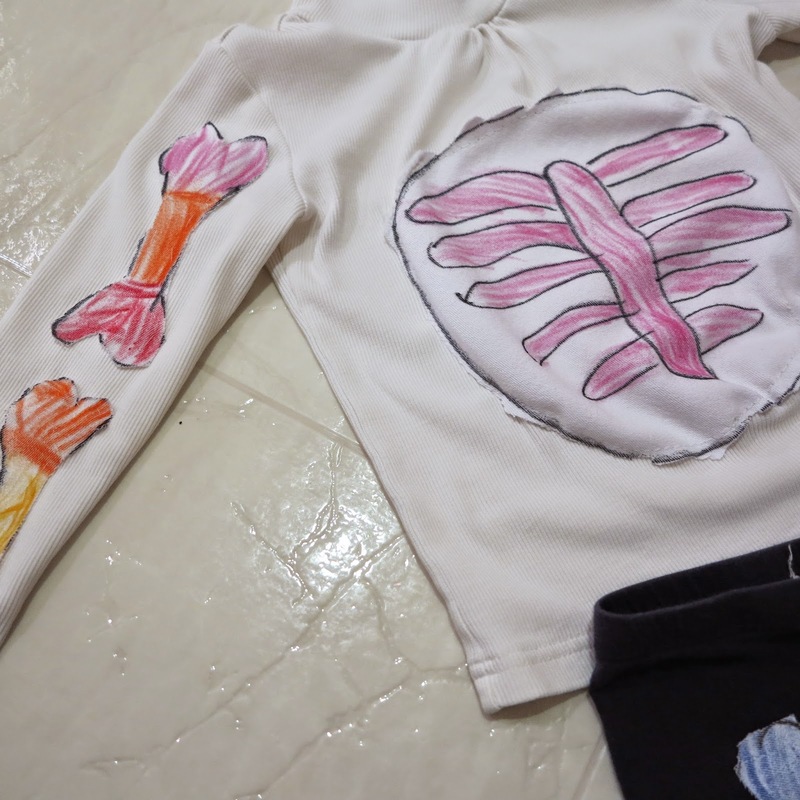 First, we drew some bones on white denim fabric scraps. Then Miss Four coloured all the bones in with fabric dye crayons, which I ironed to set the dye. We have rainbow skeletons in the House of Iles. Miss Four cut those bones out very carefully. It was a great exercise in practicing dexterity with the scissors. I then very hastily, and very roughly, basted those bones onto a pair of tights and a top that she already had in her wardrobe. Some of the stitching was done by machine and some had to be done by hand whilst watching the final season of True Blood. Admittedly, some of the bones are attached a bit wonky, but overall, the costume was a great success. It was worn for 24 hours straight. My costume was a little bit more last minute. On the day of Halloween, while the little peeps were having a lunchtime nap, I suddenly had an idea to turn the muslin of my Dior knock-off coat into a Malificent inspired gown and cape. 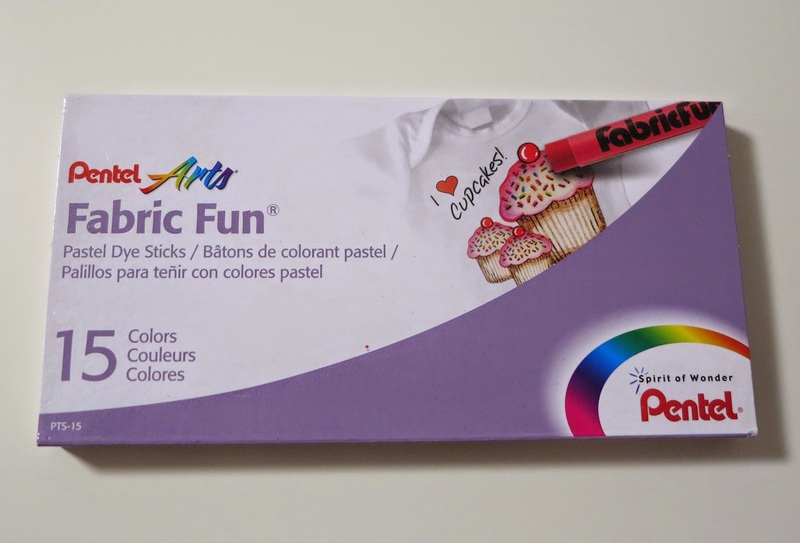 The fabric (if you can call it fabric) was the perfect colour for a fairy gone bad. 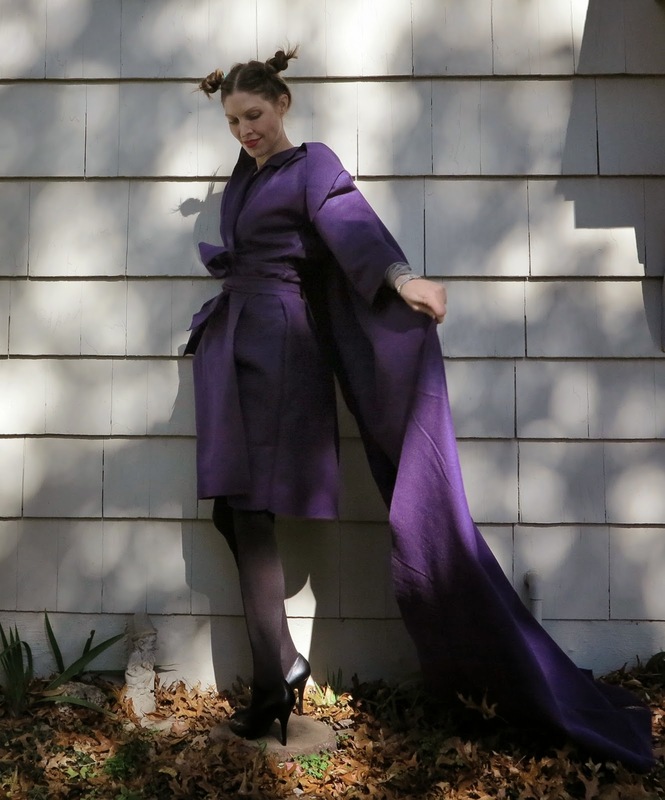 I purchased the purple textile from Jo-Ann, specifically to muslin a coat. It was $2/yd, the price of cheap calico, but it had a sturdy, structured feel that I felt would give me a better idea of how the coat would drape. It was also 100% polyester, recycled from plastic bottles. I’m nearly finished my real Dior knock-off coat, so you will soon get a better view of the coat beneath the cape. 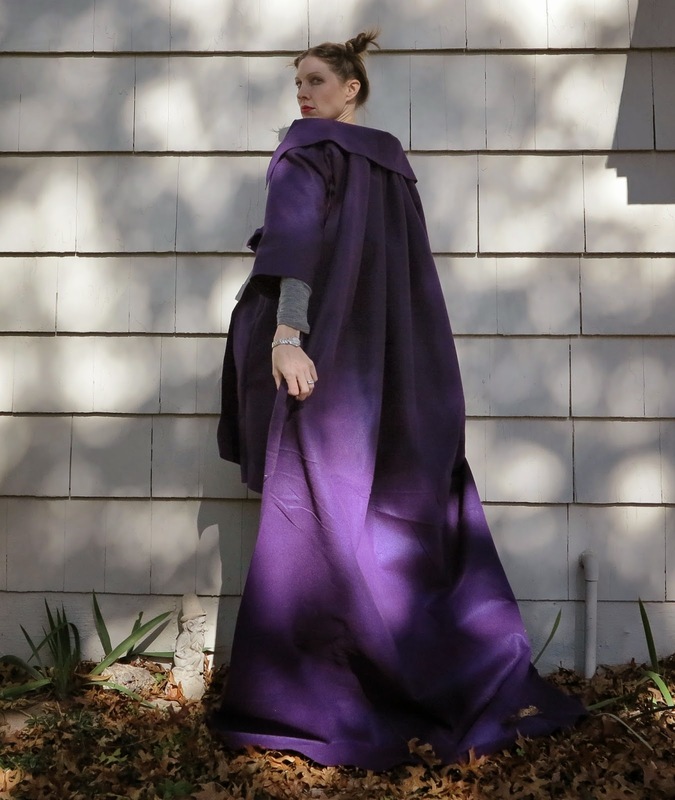 But for this costume, I simply gathered up the remainder of my purple polyester into a cape, and stitched on a big dramatic collar over the top. I cut a separate tie for the waist. None of the seams are finished because the fabric doesn’t fray. It’s like cutting felt. Perhaps I should have tried to iron it though! This entry was posted in cape, coat, Jo-Ann on October 31, 2014 by Debbie Iles.